Email is an important way to stay in touch with your customers. 📧 You can establish a rapport and engage new and existing customers with messages about important account and order info, product updates, promo emails and newsletters. Volusion allows you to add email accounts and storage to your monthly hosting plan. This way, when you send messages, they come from your store’s domain name, such as news@yourstore.com, which your customers will recognize and trust. However, because we’re all about giving you options, you also can integrate a third-party email system, like MailChimp or ConstantContact. We’ll tell you how. To host your store's email with a third-party, you’ll need to forward the MX records from Volusion to your preferred third-party email host. An MX record is a specific network name for a standard email system that defines the location and identity of that system on the web. Depending on the email system, there may be more than one MX record you'll need to forward from Volusion. Forwarding MX records can apply to any standard email system available, from other domain hosting systems like Godaddy.com to web mail systems like Hotmail and Gmail. For more in-depth information on configuring domains for use with Gmail and other Google apps, please visit some of Google's online tutorials. Volusion stores are only compatible with email hosts that use static MX records. The location and listing of an email system's MX record(s) differ from system to system. In most cases, you'll be able to retrieve the MX Records from your email host by logging into any web-based account their service provides or by contacting the host’s technical support team. ⚠️ If you currently use Volusion-hosted mailboxes, be sure to forward or save any email messages you need to keep before you point your MX records away from Volusion. You won't be able to retrieve any mail from your Volusion mailboxes afterward. To get started, log in to your account at my.volusion.com. Under the My Stores heading in the menu on the left, click Manage DNS. Make sure the drop-down menu at the top of the page is set to the correct domain name for your hosting plan. 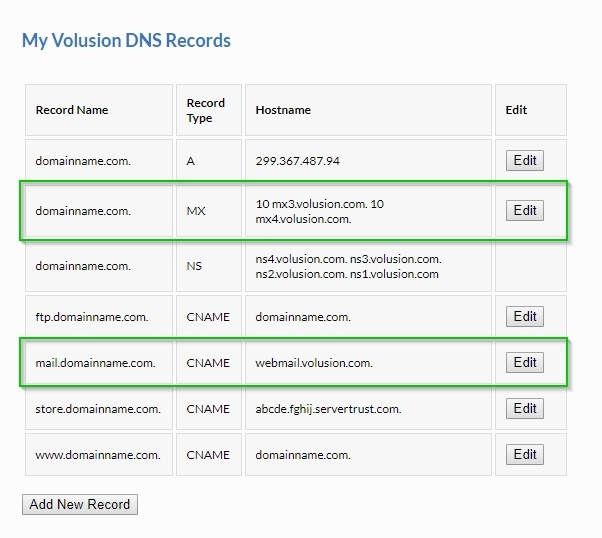 Locate the existing entry for Volusion's MX records (mx3.volusion.com and mx4.volusion.com) and the "mail" CNAME record. Click Edit in the far right column of the mail record row. Click Delete to remove the record, then click Delete a second time to confirm. At the bottom of the DNS Records table, click Add New Record. In the first field, type "mail. [domainname.com]", making sure to replace the text in brackets with your own domain name. Leave the Record Type menu set to A. In the next four fields, enter your new mail server's IP address. Edit the current MX records entry to delete the existing Volusion records and add as many as are required by your preferred email host. Each MX record should be entered on a new line. See the "What's an MX record?" section above for examples. Clear any existing records so that the field is blank. If your first MX record has a priority number, enter that number first, followed by a space., then type the full MX record name. For example, if the record is ALT1.ASPMX.L.GOOGLE.COM and has a priority of 10, enter "10 ALT1.ASPMX.L.GOOGLE.COM". To add another MX record, jump to the next line in the same text box and repeat the process. You can add as many MX records as your mail provider requires, making sure to start each record on a new line. When you're done entering all records, click Save. Please note that it can take up to 24 hours for MX records to propagate and emails to begin arriving at your new email host. If you've created mailboxes in the past, you must delete them entirely to avoid incurring email hosting fees on your monthly statement. If you never configured mailboxes for your hosting plan, this portion of the article may not apply to you. ores heading in the menu on the left, click Manage Email. If you have multiple hosting plans, make sure the drop-down menu at the top of the page is set to the correct plan. Under Mailboxes, click the x icon next to a mailbox to remove it. Click Delete to confirm your selection. Repeat the above process until there are no mailboxes listed. If you need to remove mailboxes from other hosting plans, select a plan from the drop-down menu at the top of the page and repeat the above steps. You only need to modify a hosting plan's DNS records if you plan to continue using the associated email addresses with a third-party provider. To confirm that your hosting plan has zero (0) mailboxes, click the Volusion logo to return to your myVolusion account overview. Under Account Information, you should see a "0" in the Mailboxes column. If you see any other number, reread the steps in this section to ensure you've deleted all mailboxes for the relevant hosting plan(s). Emailing your customers is a great way to have one-on-one conversations with them, but it’s helpful to keep your mailboxes and email lists organized and in one place. Whether your use Volusion’s email program or a third-party we can help you stay connected smoothly.